It’s not unusual nowadays for you to have to prepare an interview presentation at your job or promotion interview. If anything, it’s become more prevalent. Certainly in India, government by PowerPoint is very fashionable. But civil servants there have to keep it very brief. In some careers, such as the Police, the interview presentation is institutionalised. It’s also tough and demanding. But whatever the circumstances for your interview presentation, here are 10 top tips to consider when it’s your turn to give an interview presentation. So you can be ready and prepared. Interview need. Your interviewer wants to establish three things. First, can you do the job? Second, will you do the job? And third, will you fit in? That’s it. So your interview presentation will help your interviewer with answers to these questions. Pressure. Your presentation involves some pressure. Because your interviewer will want to know how you respond to that pressure. But, remember to handle that pressure than the presenter at this Nintendo presentation. Candidate comparison. 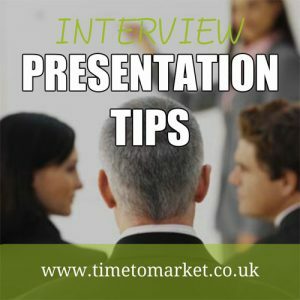 The very nature of your interview presentation invites comparison with other presentations. Yes, your interviewer will rate all the presentations by all the candidates. Thus, there is competition involved. So, you’ll have to cope with that. Planning. Your presentation will suggest how you plan work within a time constraint. Of course, that’s good feedback for your interviewer. So show off your planning. Organisation. Aim for your presentation to be a picture of organisation. Your presentation will suggest how you organise your work. Plus it will suggest suitability for a new job or career role. So, become organised. Creativity. Your creativity is on display. Yes, PowerPoint creativity. But also your subject matter, how you weave together your title, the theme for the presentation and your examples. Get creative. Strategy. It’s unusual for an interview presentation to be about minutiae. Since your interview audience is after something more from you. Therefore your grasp of the big picture will be on display for all to see. So too will be your appreciation of the interlocking themes of you, people, resource and objectives. Thus, it’s best to show your strategic side. Empathy. Your feelings for the subject should be obvious. Because you want to sound enthusiastic. Be supportive. So, aim to display your interest through your use of voice tone, pace and your choice of words. Make an Impact. It’s a competitive situation. So you need to stand out. Present with authority. Move with purpose and be unhurried. Timekeeping. We stress this one on all the PresentPerfectTM presentation courses. So, make sure that you give yourself enough time to prepare your interview presentation. Time planning for presenters is essential. So, remember to plan to the time available. If you’ve got ten minutes plus ten minutes for questions, then that’s your target. Then run to the time available. Ten minutes is ten minutes. And finally…be prepared for a shorter duration. Because even at an interview you might find yourself with less time than originally offered. Be ready. That’s it. Simple pointers for a successful interview presentation. You can learn more presentation skills for interviews with a public presentation training course at a training centre near you. So, when you feel the time is right, please don’t hesitate to get in touch.